“My work comes from thoughts about people, places, and home; about age, time, and timelessness, permanence and impermanence; about movement, migration, and belonging. People and places are depicted in images and objects that combine simple representations, layered abstractions, and plain-spoken materials. British artist, Martin Webb (b. 1964), first laid eyes upon the American West when he was awarded a Fulbright teaching exchange that brought him to the San Francisco East Bay in 1999-2000. 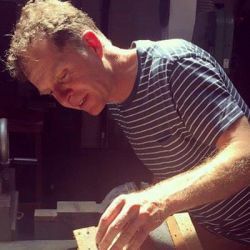 Martin Webb has also found great success as a highly acclaimed artist with numerous public commissions visible throughout the Bay Area, from Palo Alto to Napa. Whilst being primarily a studio painter, his work also encompasses printmaking, murals, reclaimed wood, concrete, ceramic tile, sculpture, and site-specific installations. "My sketchbooks tend to have as much writing in them as drawing. I make lists of ideas, intentions, and visual notes, then the paintings tend to evolve from those with very little planning." "I'm trying to make these simple universal symbols say something about our universal human experiences. About our basic need to provide for ourselves; our desire for home, belonging, and connection; and our being a small temporary part of the natural world’s continuum." "I love painting alone in my studio, but one of the things I really enjoy about working on big public projects is the instant feedback from the public. It's almost always very positive, but I've had some great conversations with people who don't like or don't get what I'm doing. Sometimes they end up understanding and enjoying the work, and sometimes we just agree to disagree!" "When I'm painting I often add a cement material to my acrylics to make a paint that layers and sands well - it's something I stumbled across years ago and became a staple technique for me! I also like to work with reclaimed wood because I enjoy working with a material that has some unpredictability and a story. My most essential material may well be masking tape." "I'm often trying to capture the memory of a specific moment or place, and heighten it's atmosphere with the visual elements I use to depict it." "With paintings I'm usually hoping that the work will make a space become a more thoughtful, contemplative one. With commissioned work I always start by thinking about how people occupy, use, and pass through the specific space, then I design the work to complement those functions." "Whatever media I'm working in my work combines simple representations of objects, recently boats or buildings, alongside abstract elements which are all about composition and color."